1942 Ed went to get a job at an aircraft factory in Columbus, Ohio and was told you are ready for the draft. Ed wanted to choose his own destiny so he enlisted in the Navy. 1942 Ed went into the Seabee’s during the time they were converting it from construction into more of a military attachment. He was sent to Carrolton, Ohio to train and drill under the Marines for two weeks then back to Camp Allen in Virginia. 1942 Ed was part of the 3rd Battalion which was the first complete battalion of Seabees. 1943 Went to the South Pacific. Ed helped the Australians prepare a base in Fiji as a backup. Ed was based on different parts of Fiji for multiple months until the project was completed. The food was very bad and the living conditions were not much better. Then he was sent to New Caledonia. The Navy offered a program to come back to the states and go to college but Ed just missed the mark on the test. Later the Navy offered another program to enter cadet school and Ed finished first and came back to the US. Went to school in San Francisco then to Elly, Nevada back to St Mary’s , San Francisco. The government was getting too many pilots so Ed was given the chance to resign from the program but have it noted on his record he did not fail. Ed was now back in general service on a ship to New Guinea. Then he flew to the Leyte in the Philippines. Then was sent to Samara then to Tabbaa and stayed there until he was discharged. 1946 Ed would go onto get his private pilot license but it eventually got too expensive and Ed has not flown for 35 years. 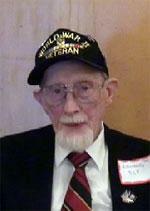 Ed was part of the 3rd Battalion which was the first complete battalion of Seabees.